Hi Verve fans! Welcome to our October New Release Blog Hop! I'm so excited to announce that there's something new in the Verve shop today! 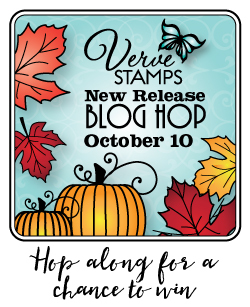 To celebrate, the Divas are putting on a blog hop sharing our first looks at the new Autumn Leaves stamp set and coordinating Falling Leaves die set. And since we love to share, we're hosting a little giveaway. Just leave a little shout out in the comments at each stop along the hop and you'll be in the prize drawing for the new goodies! Deadline for commenting is Monday, October 16. Today's prize is the October Buy it All Bundle. It includes both the stamp and die set in this release, and bought together, you can save 20% off of retail. Plus who doesn't love FREE shipping??? We're celebrating a brand new release and the shipping is on us! Enjoy free first class shipping on US orders over $35 placed October 10 - 16, 2017 in the Verve shop. Just select US Shipping as your ship method at checkout and the discount will be calculated automatically. Offer not valid on US Priority, International or Canadian shipping methods. Free shipping is calculated on your subtotal AFTER any discounts or gift codes have been applied. I started by stamping the pumpkin stamps from Autumn Leaves on white cardstock and cutting out. I colored with Copic markers. The cup with the pumpkin is made with 2 stamps from the previously released Everything Nice stamp set, which I stamped randomly on crumb cake, then colored with Copics and sponged around the edges. I could have used the cup from this set, but I was planning on using the hello pumpkin sentiment to complete the pumpkin theme, but changed my mind at the last minute and chose the happy fall cut from a portion of the Stitched Pennants die set. I finished off with a few rectangle layers for matting and a seam binding bow. 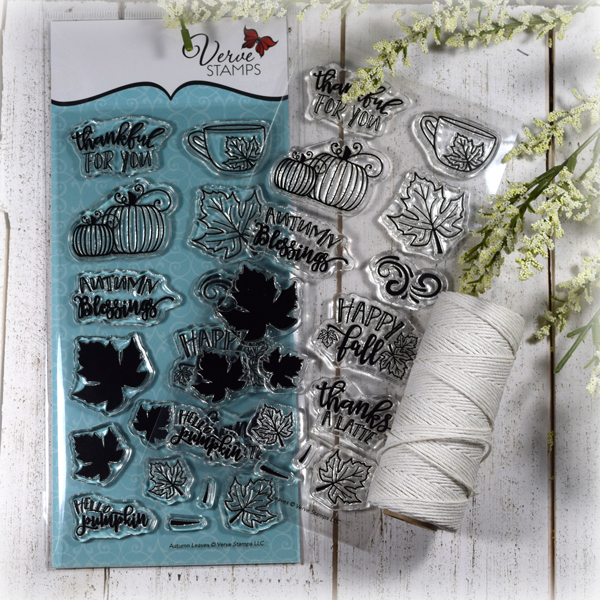 The Autumn Leaves set is an autumn inspired set, complete with falling leaves, a fabulous mug and pretty pumpkins. Whether you're saying hello, celebrating the season, or sharing your gratitude, this fall set is sure to delight. The set includes outlined images of three sizes of leaf, as well as solid counterparts for super easy coloring. The leaves and pumpkins can be cut with the coordinating Falling Leaves die set. 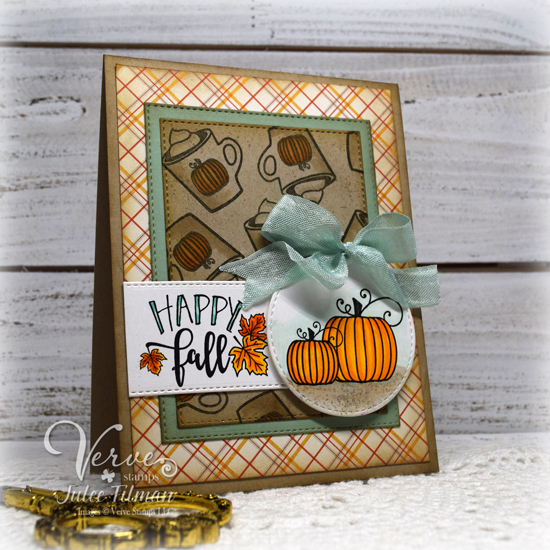 For even more fun, that sweet little cup of fall coordinates with the previously released Happiness in a Cup die set. 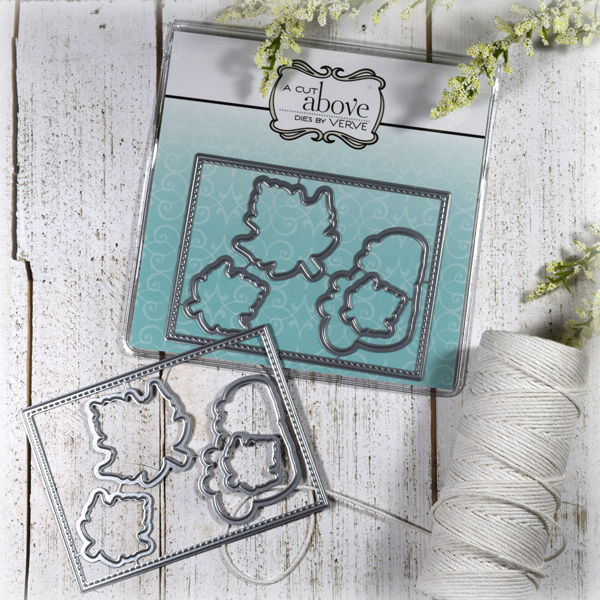 The coordinating Falling Leaves Die Set is a set of five dies. 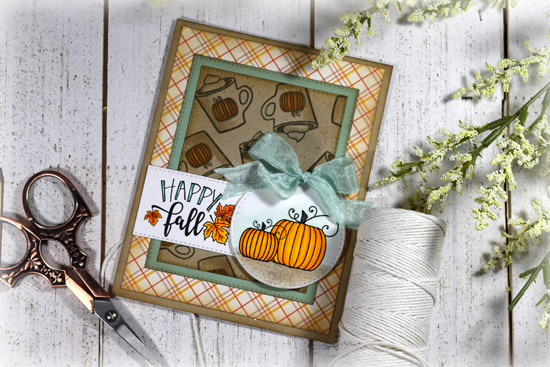 It fits the three sizes of completed leaves, the pumpkin duo and also includes a large stitched rectangle (2.75 x 3.75") that is a perfect backdrop for any fall scene. Die cuts leave an approximate 1/16" border around the coordinating stamped image. Thanks so much for stopping by today. Happy hopping! The hop kicks off on my blog, Poetic Artistry.